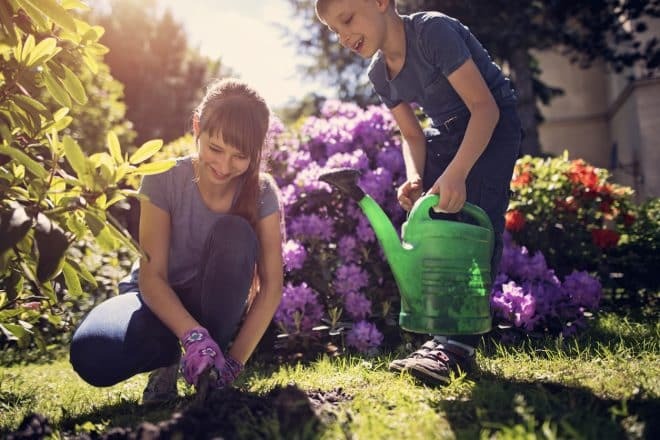 So, here are some tips to ensure new life begins this spring, and your backyard is putting its best foot forward. Your first task is to go through your garden beds and other planted areas and make sure they are clear of weeds, dead branches, leaves and other debris. Without a clear garden, it can be hard for moisture to reach the lowest roots and it’s also hard for new life to push through, which brings us to our next point. All those mother’s tales and nursery rhymes weren’t wrong, spring really is the time to plant. By planting bulbs and seeds now, you’ll start to see good growth by summer. If you’re looking for an edible garden, you’re in luck because spring is the perfect time to plant a heap of vegetables, herbs and spices, ranging from watermelon, to rock melon, parsnip, peas, to amaranth and chillies. You could even plant wasabi, and avoid the coloured horseradish the local sushi shop is serving up. If you want to add some colour to your garden, consider perennials or native species, like Kangaroo Paw and Acacias. Your soil quality will have suffered a little over winter. The most common problem will be that it is tightly packed and dry, so you need to loosen it up and add some moisture. The best way to do this is with organic compost, either from your own bin or from your local nursery. If it needs a bit of fertiliser, go with an organic, natural option and make your garden safe for kids, pets and other wildlife. Once your soil has been appropriately doctored, add some quality mulch. Mulch performs many vital roles. It locks moisture in, prevents weed growth and regulates the temperature of your soil, which is essential when the heat starts to crank up. Do you know what the best water is for your plants? The stuff that falls from the sky. The Melbourne area usually gets a lot of rain during spring, so come up with ways to collect those precious drops, for the sake of your garden and your hip pocket. Rainwater tanks are the most obvious example, but if you don’t have the space or the budget, recycle some old jars or 40-gallon drums and set up little collection points around your garden. They’ll also attract plenty of native wildlife! The wild weather of winter may have had a damaging effect on your fences, decking and other instalments. Summer is your backyards time to shine, so use these more temperate months to take care of those odd jobs. So, whenever you have a free weekend, muster up some help, grab a hammer and some nails and get your backyard summer ready. The cold nights are almost gone, which means alfresco dining and balmy nights outside are just around the corner. Of course, those nights are only fun if you have some light to enjoy them under. Outdoor lighting is a cheap, quick and super easy way to revolutionise your backyard. The best part is, they are one of those rare things that are both functional and aesthetic, so you really can’t go wrong. Pathways perform two functions – they make your backyard more accessible, and they create the essential aesthetic ideals of order and division. They are easy to build, and it won’t cost you much if you outsource the task. On top of that, they keep your garden and interior cleaner, because you don’t have to traipse through the mud. A BBQ or an outdoor kitchen is the perfect project for spring because it will be ready for the ultimate ‘BBQing’ season. The most important thing to consider when choosing a barbecue is longevity. It’s worth spending the money now and getting all the features you need instead if settling on a cheap four-burner and having to replace it next year. And, make sure you build it into a bench, so you can chop, prepare and cook outside because there’s nothing better than nights around the barbie.